Vacation rental condominium. Sleeps 3, 1 bedroom, 1 bathroom. No pets allowed. 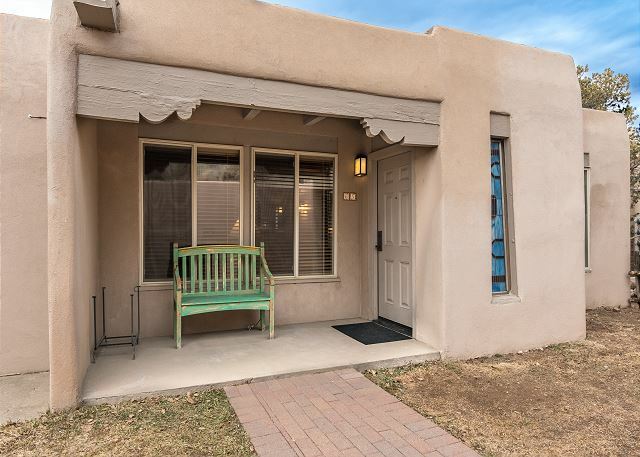 This newly refurbished condo right downtown Santa Fe is an easy 2 walk block to the Plaza, and 6 Blocks to the Historic Arts District of Canyon Road. Relax fully in the King bed with a memory foam topper while enjoying the wood burning fireplace. Open living, dining, and kitchen areas fully enjoy the wood burning Kiva fireplace in the living room. An additional guest will enjoy the full sofa sleeper in the living room. 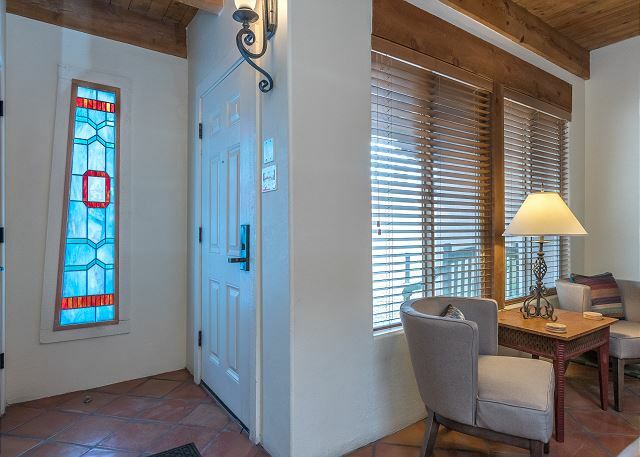 This home features vigas at the ceilings, mexican tile counters, saltillo tile floors. Central heat and air conditioning. The bath offers 2 sinks and a walk in shower. 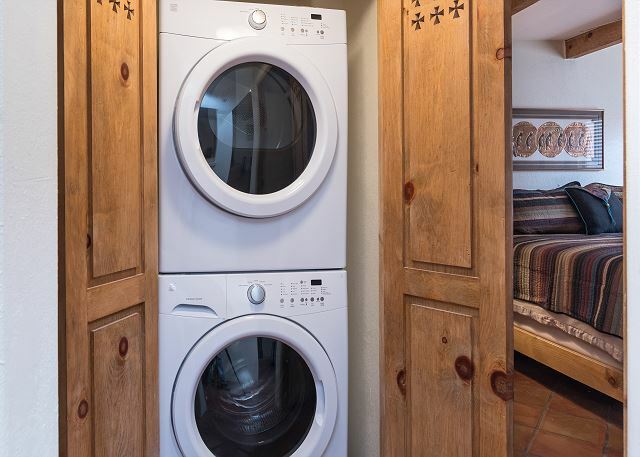 A convenient full size, new stack washer/dryer for your use. Kitchen appliances include a dishwasher and glass cooktop range. The Keurig coffee maker will simply start your day off with a positive attitude. Plus, the king bedroom has a full view of the fireplace as well. Cable television and wifi for entertainment. Tvs in living room and bedroom. Covered portal at entrance. Approximately 679 sq. ft.
We stayed at Casita Caliente for 4 nights. This home is well maintained and appointed, including the much-appreciated starter kit of K cups and other coffee supplies. The home is in a very, very quiet area, at the top of a hill with great views. Other reviews point out the climb back up from downtown Sante Fe can be daunting, and it is, but it didn't stop us from doing anything. 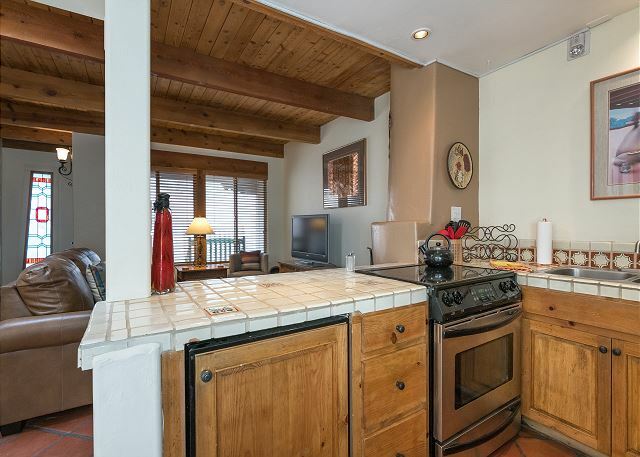 Overall, this is a terrific place to stay to enjoy Sante Fe and all it has to offer. We enjoyed this lovely and neat place. We were impressed by the amenities and cleanliness. Very accessible to a main artery in SF, Paseo de Peralta. For the mobile, easy walk to the Plaza. We enjoyed our stay. The location was perfect for our needs. The small refrigerator was a bit of a problem and made it difficult to plan meals. Also, the freezer compartment hadn't been defrosted in a while. Where did you get such a high bed? We were able to manage without a step-stool, but I can imagine that some elderly people would have a problem. Beautifully appointed and spotless. Perfect for a couple. Wes really not an easy walk to the plaza. Would have appreciated info on using tv. A delightful stay and would rent again. Very clean, very quiet, and very safe place to stay. Our biggest issue was trying to find it using the given instructions and NOT our GPS. We got lost twice and finally found it only by driving around and looking for parking lot B. Here are super easy instructions to find the casita. Stay on St Francis (285) until you see Paseo De Peralta, turn right and travel a short distance to Bishop's Road (gorgeous red church on the corner). Turn left on Bishop's Road 2-3 blocks to Artist's Road. Turn right on Artist's Road and go to the top of the hill and turn right on Prince Road. Follow Prince road to the second parking lot on the right (lot B) and you are there. We went in and out by this route over and over and there is no better or easier way. The given instructions were very-very jangly and super hard to follow. The suggested route above is very easy to follow with less turns, stop signs, red lights, etc. Also, we read the instructions to "park in our designated parking space." We looked thoroughly and never found a designated space, just the open for all parking lot. It is a long haul to the Plaza and you had better be in great shape if you try to walk back up the hill. We used Uber/Lyft which worked great. Very good; accommodations perfect for two people; location great once we got acclimated to the elevation (steep climb on our return to the casita! ); loved the Fort Marcy park right across the street and the location was close for walking just about anywhere. Only suggestion would be to bring your own pillows and realize the refrigerator is a mini not full-sized. Other than that, we would rent again. Directions to property were spot on. Following just GPS would have been a mistake. Property was clean and well furnished on arrival. The location of the unit is walking distance from Santa Fe Plaza, High altitude [7,199 ft] and hill could be problematic for some. There were stairs involved to get to our unit. We used this property as our base for visiting other areas of interest in New Mexico and it was great location to work out of. Most evenings were spend at the Plaza for dinner. Unit was quite. I stayed 10 weeks and it was the perfect place to stay. Situated in central Santa Fe. Very quiet, clean and cosy. What a wonderful experience! Travellng alone, I felt very safe and comfortable. It was a short walk into town and to Canyon Road for wonderful art and museums. I highly recommend this Fort Marcy Condo, very clean and well appointed. Best Sunsets in Santa Fe! Walking across the street to Old Fort Marcy, you'll have panoramic views of Santa Fe and the surrounding mountains. Best sunset views in all of Santa Fe, as proof by the number of photographers that frequent the hilltop. An easy walk to The Plaza and downtown Santa Fe for anyone in reasonable shape - the Casita is on a hill, so be ready for a little exercise on the walk home. A great vacation retreat! 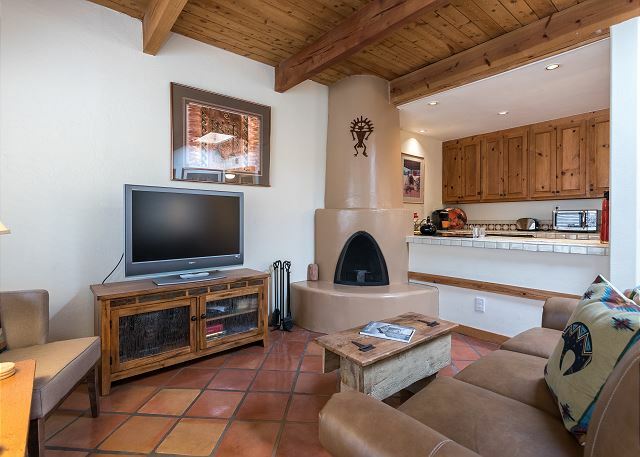 My husband and I spent nine nights at this adorable Santa Fe Casita. 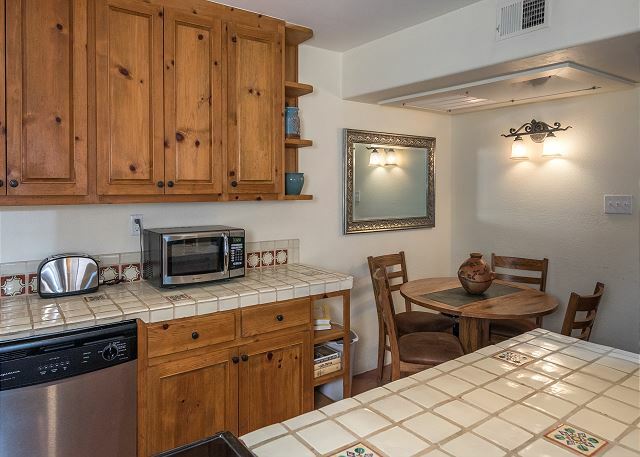 The Casita is well-equipped, beautifully decorated and super clean. The king size bed is unbelievably comfortable and when our daughter joined us we discovered that the sleeper sofa is incredibly comfortable as well. Plenty of towels and paper products are provided as well as shampoo, conditioner and soap. The shower is the best! The kitchen is very well equipped. The location of the Casita is excellent, we walked to the Plaza daily. The location of the property is very quite and peaceful and we felt very safe. I would love to stay at this Casita again and I recommended it without reservation. Our experience with the property manager was wonderful. Donna was very attentive and answered all of my questions about the Casita and Santa Fe quickly. She's a very nice person to work with. We had a great time in Santa Fe and absolutely loved this property.